The picture above comes from a very interesting website devoted to tattoos and their history across time, space and cultures. 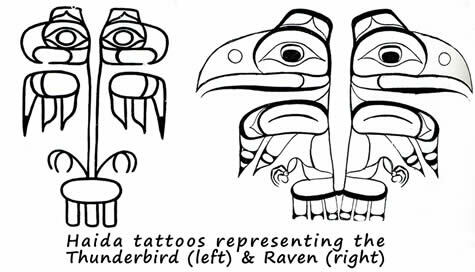 The Haida people and their culture were also featured in this article about their body art and meaning behind it. Here’s a slide show focused on modern Haida-inspired body art. Mo Naga and his fight for preserving traditional tattooing in India. An interesting discovery in Corpus Christi, TX where a trove of old tattoo flash was found! ‘Historical figures and their tattoos’ and, the Laubachs, a German family whose history and life are connected to tattoos very closely (the shop). A report from a lecture about modern tattoo culture coming from high art. People and their tattoos: Takashi Matsuba and his NYC-based shop where he tattoos tebori way, Dee Crowner, an IA librarian who’s not afraid of showing her wild side, Bill Kaufman, a tattoo artist also from IA, an American tattoo artist living in Germany who creates his own army (the shop’s website) an interview with a tattooed Dutchman, a rapper Kid Ink and his tattoos and finally David Cata who makes incredible things with his skin. This guy deserves a separate paragraph as he seems to be doing amazing things – a doctor who saves tattoos post-op! A German article discusses what drives ‘body modders’ to doing to their bodies what they do but I found it too simplistic to my taste. I dare to think our reasons are more complex! And a documentary from Japan about a Japanese right-wing activist who happens to have quite extensive tattoo work done.